Uncomfortable in society and disliking crowds, wherever he goes, he always sits "in the last row, near the exit". His only sorties consist of long walks with Teresa, his companion of many years, whom he doesn't marry, even though she represents for him the ideal woman. This woman, the real one, that he so long sought without finding. "Loving and maternal at the same time, without artifice, unpretentious, without ambition, without care for the morrow." He is against marriage. Absolutely. He has always been. Contrary to the vows exchanged before the priest, he knew in advance, when marrying Regine, his first wife, that he would not be faithful to her. Marriage? A fraud. Moreover, he's only gone to two wedding in his life. His own. Dressed with simple elegance and a hint of stylishness, Teresa listens to Georges, her charge. Since 1962 when they met when she was working as a domestic in the château d'Eschandens, she watches over him, caring for his health like a devoted nurse, warm and cheerful. A privilege afforded Simenon since his fall in 1965, which left him with seven broken ribs. During the three weeks he was hospitalized, Teresa slept in his room on a hastily installed cot, keeping him company, as she does today, on his return to the house at Epalinges, his condition necessitating constant care. It's she who, today, goes out to buy his string ties that he has always preferred to neckties, and which contribute, like his pipes, Chief Inspector Maigret, and his 500 novels, to his legend. The only luxuries in the functionally-furnished house are his collection of pipes  including a gold one especially designed by Dunhill  and two he uses. The richest writer on the planet, whose every novel published in the USSR, he confirmed, is an edition of more than 500,000 copies, not only lives like a hermit, but like an ascetic, taking refuge, most of the time, in his little Scandinavian-style office where, I can attest, are found all sorts of books except his own. Those are at the Centre Georges Simenon in Liege. Teresa chimes in to note that he has never re-read one. Which he confirms. Once written, he forgets them. Why? Georges, whose astonishingly well-preserved face is hardly marked by wrinkles, smiles. He slowly stuffs his pipe, his small eyes, alive and piercing, rest on me... "Gide brought me something essential, confidence in myself. I'd never believed, deep down, in the importance of what I wrote." Capable of concocting five or six novels a year, some in two weeks, the Maigrets in just one, knocking out between 30 and 60 pages per day, translated into 57 languages and having published under various pseudonyms, including Christian Brulls, Jean de Perry and Georges Sim, this lumberjack of letters that a newspaper director, in 1926, wanted to display on the stage of Moulin-Rouge, refused the label of writer and even more that of man of letters. "I've never liked literature. I've never written any. I'm not an intellectual", claims Simenon, who has always preferred the fine title of novelist, and since he no longer writes, has inscribed on his visiting card, "without profession", and on official papers, "retired". A retiree unlike others, and who, at 83, continues to sign prolifically the innumerable contracts he enters with cinema, television and foreign countries. This task, in which he is assisted by his secretary, Joyce Aiken, and another in his office at Laumont, occupies the large part of his days. Along with the mail. Scrupulous, Simenon considers it his duty to respond to his thousands of readers for which he has the greatest regard. Between two letters, he climbs to the second floor of the house where he has a small gym set up. Each day, he performs some exercises, secret in form. 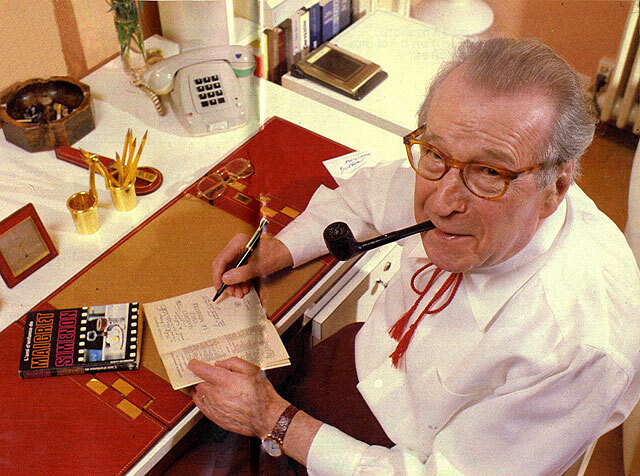 In spite of the serious brain operation which he underwent in 1984, Georges Simenon seems well. And he continues to present what he calls "his little cinema". Even if since "Intimate Memoirs" in 1981, he hasn't written, he continues to dream of his places, his stories, those who populate his novels. "Colors in disorder, in movement which suddenly forms a precise image... a teeming street in Liege, long ago, a deserted quay in a port, ossified boats in the fog or at dusk." Lives of others, his own. All of a life of which he has used every moment, but which has flown second by second like the images of a film, and which escapes him. He recalls the era when he was an apprentice confectioner, an errand boy, his debuts at the Gazette de Liège, when they called him "Little Sim", his first pipe smoked at 13, the little room below the roof, at 16, where he brought the girls, his marvelous adventure with Josephine Baker, all seems so unreal, drowned in an ancient fog. The snow has stopped falling. Teresa proposes to Georges that they go out for a walk. She is very real, Teresa. And so serene. As they move into the distance, a touching couple, walking with a lively step and at the same pace, attached to each other, I reflect on what Georges said to me an instant before, pointing to the magnificent 200-year old cedar... "I've always moved, changed my house. About every ten years. My memories are organized as a function of the houses I've lived in. Now, there won't be another. This will be my last one. At the foot of this cedar where I've scattered the ashes of my daughter." 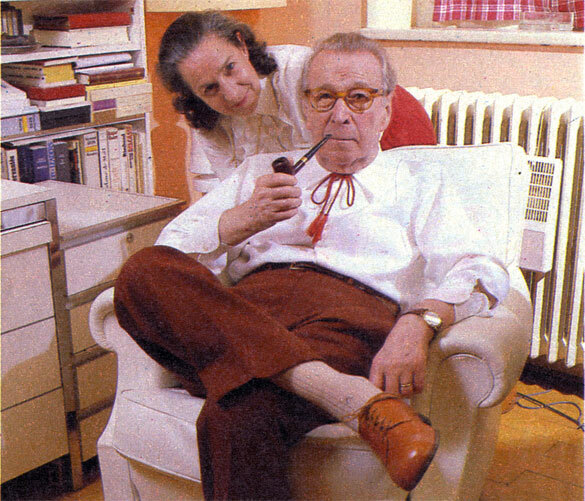 It's in a little private house at the base of a towerin Lausanne, that Georges Simenon lives. before his work table, his legendary string tie at his neck, he inscribes Maigret and the Minister, written in 1954. At the side of his companion, Teresa. 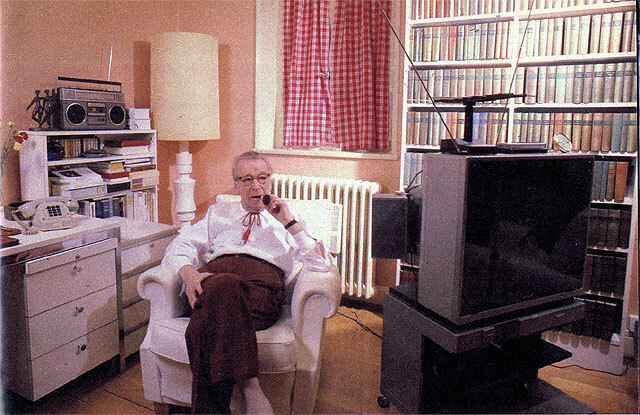 Georges Simenon in the single room which serves him as office, living room and bedroom. 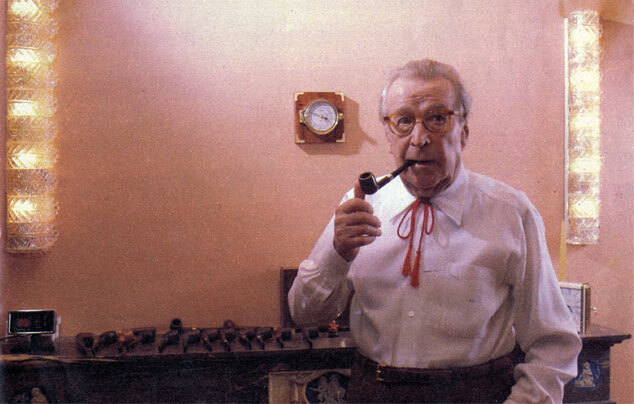 The sole object of luxury in the house, his collection of pipes.